The Wednesday crash of a robotic Russian cargo spacecraft highlights the United States' need to develop new spaceships of its own, and quickly, some officials and experts say. The loss of the unmanned Progress 44 supply vehicle was the latest in a series of Russian launch failures over the last 10 months. That track record could be a worry, since the United States is relying on the Russians to ferry its astronauts to and from the International Space Station in the wake of the space shuttle fleet's retirement last month. NASA is encouraging American private companies to take over this orbital taxi service in the near future. But for some, these capabilities cannot be developed fast enough. According to Russia's ITAR-TASS news service, the Progress 44 wreckage fell in the Altai region of eastern Russia near the village of Bizhelbik. Recovery efforts are under way, though bad weather in the region has caused some delays. "We've known this for some time, that there were very strong similarities between Soyuz-U and the Soyuz-FG," Mike Suffredini, NASA's program manager for the International Space Station (ISS), told reporters yesterday. "We were told today that, when you get to the third stage, they're particularly similar." That makes some people nervous — and longing for the day when the U.S. has more options for getting into space. "NASA needs to conduct an investigation before another Soyuz spacecraft with new ISS crew members can be launched, and it is unknown how long such an investigation will take," said Rohrabacher, who is a senior member of the House Committee on Science, Space and Technology. The Progress 44 crash is not an isolated incident; it tops a list of other recent Russian launch mishaps. On Aug. 18, a Proton rocket failed to place a $300 million communications satellite in the proper orbit. On Feb. 1, a Russian Rokot launch vehicle similarly underperformed, failing to deliver an Earth-observing satellite to the proper orbit. And on Dec. 5, 2010, three pricey navigation satellites lofted by a Proton crashed into the Pacific Ocean. 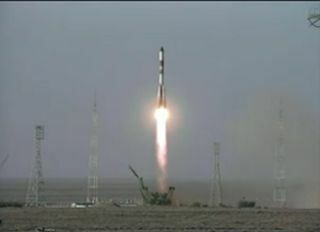 "These and other failures point to serious follow-through quality control failures long expected and of concern to Russian space analysts," said Charles Vick, a senior technical and policy analyst at Globalsecurity.org. The addition of the Soyuz-U to the list raises the stakes and should increase the scrutiny, since it's so similar to the crew-launching Soyuz-FG, Vick added. "This now involves human crewed flight of international crews, and that will definitely give everybody pause to review all aspects of this string of failures," Vick told SPACE.com in an email interview. A boost for private spaceflight? When NASA retired its venerable space shuttle fleet last month, the agency became dependent on the Russians to carry its astronauts to orbit — for now. NASA is encouraging American private companies to develop their own crewed vehicles, some of which could be operational by 2015. That's not soon enough for Rohrabacher. He wants NASA to funnel more money to these companies to speed things up, taking the cash from agency programs that he deems less important. The Progress crash may not turn out to be as big a worry as some people think, however. Space policy expert John Logsdon, for example, urged a little patience and perspective. Logsdon, professor emeritus at George Washington University, pointed out that yesterday's crash was the first failure for a Progress vehicle after 43 successful missions. And the Soyuz-FG, for its part, has a perfect record — more than 20 successful launches since its maiden flight in 2001. "So it is very much overreacting to suggest that this single failure suggests that this Russian launcher is no longer reliable," Logsdon told SPACE.com in an email interview. The first order of business, Logsdon said, is to figure out what caused the crash. "The United States has to insist on maximum access into the Russian launch failure investigation and the remedial actions being taken to assure itself that this was an isolated failure, not something reflecting a more systematic issue," Logsdon said. "Of course," he continued, "if the investigation discovers the kind of management problems unveiled in the investigation of the 2003 [space shuttle] Columbia accident or some across-the-board decline in Russian safety and mission assurance efforts, that would be a cause for concern."